Living... in New York City in an apartment with his wife, Shelley. Though he seemingly spends most of his time with the members of the band Flight of the Concords, Bret and Jemaine. It’s strictly business, you understand. Profession... deputy cultural attaché at the New Zealand consulate, but that’s just a day job. Murray sinks most of his time and passion into managing the Flight of the Conchords, although he has no idea how to manage a band. He likes trying to help his friends, but has arguably done more to harm the band than help it. Still, Murray is sincere in his desire to be a good band manager, and often at least helps to keep the band’s spirits up. Interests... Bret and Jemaine. Although he rarely actually helps his two friends in any capacity, Murray really enjoys spending time with them. He’ll do anything that takes him away from his real job and wife. Relationship Status... married to Shelley, at least according to Murray. His wife is never seen by any of Murray's friends but he does remain loyal to her. Murray feels that his duties as band manager extend into the realm of Bret and Jemaine's romantic relationships as well, often offering them advice on dating and inter-band politics. While obvious, his advice isn’t always bad: "I've told you. When you are in a band, you don't get with your bandmate's girlfriend. Past or present." 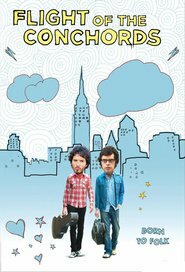 Challenge... managing Flight of Conchords to the top, or at least not driving them further into the poorhouse. Murray's main struggle in life is to be half as competent as he is passionate. There’s no doubt that he takes his position as band manager very seriously, devoting at least as much time to management as the band dedicates to their music. So far, alas, his efforts are mostly amateurish and ineffective. But hope springs eternal, especially for Murray. Personality... extremely good-natured, but very dense. His inability to manage the band stems in part from his lack of knowledge about the world of music, and in part from his startling naivety. A frequent victim of internet scams, unscrupulous promoters, and anyone with half a brain, Murray has no business managing other people’s lives. Still, despite his flaws, he is a good and loyal friend who truly believes in Bret and Jemaine. Murray Hewitt's popularity ranking on CharacTour is #2971 out of 5,000+ characters. See our top-ranked characters and read their profiles.